In Gladstone, MI caring for your lawn and keeping it looking great is a constant battle. With high temperatures in the high 70's and about 3 inches of rain each month the grass grows fast and mowing it consistently each week is the only way to make it look great. In addition to keeping the lawn mowed you need to have a professional turf management program to fertilize the lawn as well as kill the weeds if you really want your lawn to be healthy throughout the summer. One of the biggest issues we have here in Gladstone with lawns is fungus like "Red Thread Lawn Disease" that are caused by the mild temperatures and moist conditions common to our area. Having some general guidelines for how to properly care for your lawn in the summer can help improve your lawns appearance and health. Keeping your lawn watered is one of the most fundamental ways to keep your lawn healthy. Proper watering is important and there is a lot of different information out there concerning how to water your lawn and chances are it is probably right for the area. Here in Gladstone where the temperatures are mild and we have higher humidity you should avoid watering late in the evening or very early in the morning. But you shouldn't wait till the hottest part of the day either. We recommend watering in the morning between the hours of 6AM and 9AM, this allows for the grass to dry in a reasonable amount of time but not evaporate too quickly. A thick lush green lawn is only achieved by having a proper fertilization and weed control program in place. Even if you decide to mow your lawn yourself, it makes sense to hire a licensed professional to take care of the fertilization and weed control for you. Applying the correct amount of fertilizer, pre-emergent, and post emergent weed control chemicals can make the difference between a beautiful green lawn and one that is turning brown. Here at Olson's Lawnscape we have a proven fertilization and weed control program that will keep your lawn looking great no matter the season all backed by a 100% Satisfaction Guarantee. What good is having a beautiful lawn if you can't use it? Controlling outdoor pests like mosquitoes, fleas, ticks, spiders and more are essential to having an outdoor space you can truly enjoy. Not only will pest control make the lawn more enjoyable for you but it will make it more enjoyable for your pets too! We always recommend having professional pest control services performed by a licensed professional that has the training and experience to not only kill the bugs you have in your lawn but to implement a pest management plan that keeps them from coming back, like the one we provide for our pest control clients. 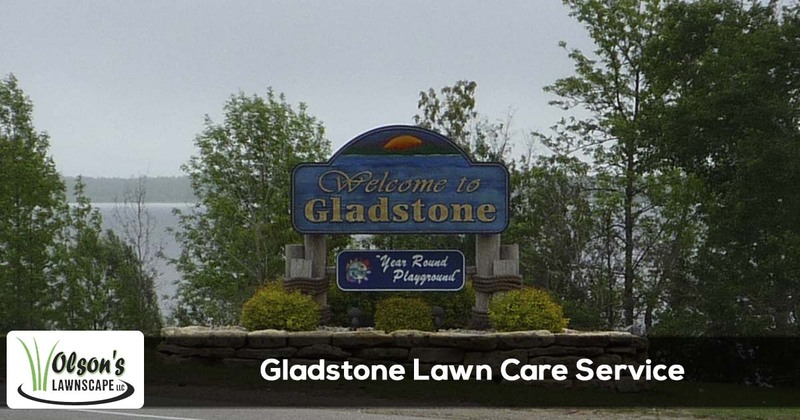 If you are in need of professional lawn, landscape, or pest control services in Gladstone, MI we invite you to give us a call and see how we can help you at 906-399-1718.